Pkew Pkew Pkew is fighting off adulthood with cheap beer and Power Chords. This summer I've been invited to four weddings, a handful of people I know have gotten pregnant, and I found out that my best friend from elementary school, the same friend who used to light his farts on fire and throw rocks at the local drugstore, has purchased his second home. I'm in my late twenties. By most accounts marriage, children, and home ownership should be a part of day-to-day life, but to be honest these things make me nervous. They all seem hopelessly adult. And no matter what I do, I have never really felt like an adult. I had this thought in mind while prepping for my interview with pop-punkers Pkew Pkew Pkew. Earlier this month the Toronto four-piece released their self-titled full length, a nineteen-minute opus full of gang vocals and rift rock, that plays like an eleven track essay against growing up. The songs – which include titles like "Mid 20's Skateboarder" and "Let's Order a Pizza" – are comedic and fun, but at the same time hint at the existential, quarter-life, fear I've been reckoning with. My methods to deal with that fear have been to navel gaze and continuously worry. Pkew Pkew Pkew gets drunk and plays guitar with their friends. Their methods seem like a lot more fun. 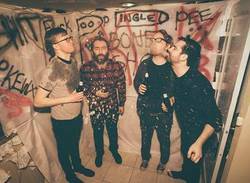 I caught up with Pkew Pkew Pkew just before their sold-out record release show at The Smiling Buddha. After sound check we made our way to their van. As I put together my recording equipment guitarist Ryan McKinley reaches underneath one of the seats and pulls out a six-pack. He hands a beer to each of his band mates, tosses one in my direction, and I immediately ask whether or not it's practical for anyone over twenty five to play in a band. No chill. "Well…I guess you could say what we're doing is a prolonged adolescence, but the only thing I've ever wanted to do was to play in a band," explains singer Mike Warne. "Sure, some people might see working a day job or living with multiple roommates as a kind of sacrifice but what else are we supposed to do?" "Mike and I actually lived in the same room to save money," adds McKinley. "Like, we had separate beds but it was the same room. It was really cheap and when I think about that…yeah. We weren't there a lot, but still. Anyways, now we get to play songs we wrote and go on tour." He finishes his beer and laughs. "You make choices." Pkew Pkew Pkew formed after Warne put out a Craigslist ad looking for like-minded musicians. McKinley was the only one that answered, replying with a link to a Myspace page filled with his punk covers of TV Show themes. The two quickly hit it off. They agreed that the local music scene was full of artists that were taking themselves too seriously, and while there was a lot of talent around, it didn't seem like anyone was having very much fun. "We wanted to make songs that you could sing along to the first time you heard them," says McKinley. "We wanted the shows to be these really engaging experiences." "I would write these lyrics about the stupid stuff that was happening in my life," adds Warne. "Like, these true stories that were going on. I was just trying to be honest and make stuff I would want to listen to, like the type of punk that we loved growing up." People are listening. Pkew Pkew Pkew's earnest lyrics and power-pop sensibility has landed them opening spots for The Hold Steady and Diarrhea Planet, and the band is about to embark on their first American tour with PUP. While this seems like success from an outside perspective, Warne quickly puts everything in context. "I'd love to be able to do this as my only job, but I had to work four shifts in a row to make sure I could get the time off for the tour. It's kind of like any of the songs I write. If there is going to be three really stupid lines, I want one really meaningful line at the end. If there is going to be three meaningful lines, I need at least one really stupid one. That's life. It's all a balance of things." At the show that night the band took the stage and blared through their album in its entirety, along with a handful of b-sides, in less than half an hour. The crowd was made up of patrons my age and older, and they went off like they were in their teens. There were stage dives and high fives. There were pile-ups and sing-alongs. Towards the end of the set Pkew Pkew Pkew played a cover of The Bouncing Soul's True Believers and I decide to jump in the pit, despite carrying a messenger bag with my laptop, and wearing a pair of glasses. Someone picked me up and I threw my fist in the air as singer as the band hit the final notes. It was the most fun I've had at a concert in a long time and my back hurt for four days afterward. You make choices. Words by Graham Isador on June 21, 2016, 3:33 p.m.
Posted by Graham Isador on June 21, 2016, 3:33 p.m.
Posted Jan. 26, 2019, 11 a.m.
Posted Sept. 14, 2018, 9:29 p.m.
Posted July 16, 2017, 11:03 a.m.
Posted April 28, 2017, 10:12 p.m.
Posted Oct. 6, 2016, 10:11 p.m.